Guardian US has announced two senior editorial appointments. 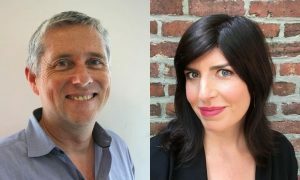 Jane Spencer joins as deputy editor, strategy, while David Taylor is promoted to deputy editor, news. Both will report directly to Lee Glendinning, editor of Guardian US. Before joining Guardian US, Spencer worked at Fusion, where she held the roles of editor-in-chief, digital and senior vice president, emerging platforms. A former Nieman Fellow, Spencer also served as both executive editor and managing editor of the Daily Beast, as well as overseeing digital content for Newsweek. She was a correspondent in the Wall Street Journal’s Hong Kong bureau for two years, winning a Pulitzer Prize in 2007 as part of a team for the Journal’s ‘Naked Capitalism’ series on China. She joined the Journal in 2002 as a staff reporter in New York. At Guardian US, Spencer will spearhead cutting-edge projects and drive innovation across the newsroom, with a particular focus on mobile and video. Taylor joined Guardian US in September 2015 as head of news, overseeing day-to-day news operations. He has since led the Guardian’s coverage of the 2016 presidential election, while stewarding major news events including the Orlando and San Bernardino shootings. Taylor previously held the role of head of news at the Times of London, winning multiple awards, before which he served as the UK newspaper’s US editor, based in Washington DC. He has held numerous senior news roles at both the Times and the Guardian. With a journalistic career spanning more than 25 years on both sides of the Atlantic, David will continue to bring his unrivaled news expertise to bear at a strategic level. Guardian US reported record traffic in June 2016, with 41.8 million unique browsers, according to ComScore, up 33% on the same time last year. The editorial team has most recently won a multitude of awards for its ongoing investigative project, the Counted, which exposes and documents lethal force used by law enforcers across the US, while the Guardian’s coverage of the unfolding US presidential election includes deep reporting, lively opinion and analysis, a 24/7 election live blog, and the launch of ‘The Minute’ a mobile first, immersive daily update of all the news and views from the campaign trail. Spencer joins Guardian US on August 15.